The government College Bomdila is celebrating its annual day in befitting manner with great enthusiastic way. 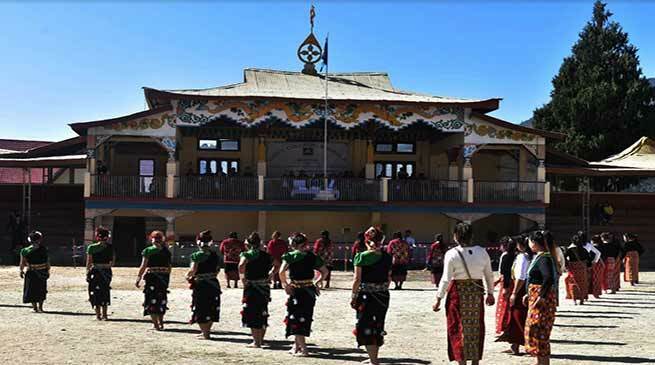 Inaugurating the event on Thursday All West Kameng Indigenous Peoples Society (AWKIPS) President Tsering Sonam appreciated the teaching and non teaching staffs for their effort in promoting the education scenario of the district are area. He appeal the students to remain sincere in their career so that to become a good professional and come and serve our own state for all round development. West Kameng SP Raja Banthia grace the occasion as guest of honour. Banthia in his address on the occasion stressed the need of maintaining sincerity, devotion and dedication in academic activities. He urge upon to create a healthy environment where all irrespective of age and denomination and designation remain peace with a healthy body and sound mind to remain a good citizen of the state and country. Principal Sangja Khandu highlighted the overall development of the college and performance of students in the university examination, he stressed the need of more infrastructure in the campus. Government College Union Advisor Dr. Tashi Phuntso, Students Union General Secretary Thuten Wangda also addressed. The programme was held at Buddha Stadium.